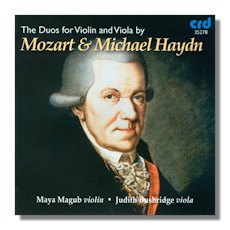 This very exciting set pairs together the complete set of six duos for violin and viola commissioned from Michael Haydn and completed by Mozart. It is a well known fact that the master from Salzburg rarely composed music for 2 instruments, and with the exception of his sonatas for piano and solo instrument, the only duos are the 12 Duets for 2 Basset Horns, K. 411. The two works on this recording were written as a favour to his friend Michael Haydn, Joseph's younger brother, who had received a commission to compose 6 duos for this combination of instruments, but due to illness had only completed four. With his friend's fee in grave danger, Mozart offered to help, and he duly completed the other two, anonymously of course. While, naturally, the style of composition of the two differs slightly, Mozart's pieces are on a higher plain, and it must have pleased him immensely when his duos received more praise and attention than the other four, albeit his ability to stay as close as possible to Haydn's language. First published in 1783 as a complete Haydn set, posterity has looked more kindly on the Mozart pair, while Haydn's four are rarely performed. Notwithstanding the contrasting talents of the two, this issue offers some splendid music, brilliantly crafted and executed. Indeed, Magub's and Busbridge's virtuosic prowess shines throughout, and the way they serve this repertoire is nothing less than a treat. Highly attractive if somewhat unusual stuff.